Ok, most of you when you think of bread pudding immediately think of dessert... but have you ever tried a savory bread pudding? 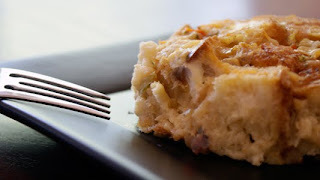 I took a cooking class last year and we made this fabulous onion & mushroom bread pudding... something I would have NEVER tried except it was part of the class. And. I. loved. it. If you like caramelize onions and you like mushrooms - this one will be right up your alley. trust me. Just give it a try... and now that you know how to caramelize onions, this will be a snap. Right? Caramelize your onions using onions, sugar, salt & olive oil (using the method I described here). When they begin to caramelize add the mushrooms and continue to cook. Cook until onions are golden brown and the mushrooms have caramelized and released their juices. Add sherry and stir to lift any caramelized onion on the bottom of the pan. Remove from heat and set aside. While your onions & mushrooms caramelize, spread out the bread pieces evenly on a baking sheet. Place in oven for 5 -8 minutes to dry the bread slightly but not to add color. Set aside to cool. In a casserole dish, layer the bread with the onions and cheese. Pour remaining egg mixture over the top. Bake for 35 minutes or until the egg mixture is set.